WinPatrol v28.1.2013 was released to add several enhancements as well as to include several fixes to version 28. Allows WinPatrol to start for current user or all users. Reduced monitoring during all sleep states to save battery usage. Improved handling of repeating changes made by partner programs. Fixed Reset function to remove duplicate Scotty icons. Fixed Reset function to remove duplicate Uninstall entries. Fixed bug in system tray icon behavior that could have produce unknown results. Today Microsoft released KB2840149 to replace KB2823324. Microsoft stopped pushing KB2823324 via Windows Update and removed it from the download center after issues were reported on Windows 7 and Windows Server 2008 with certain third-party software. If you uninstalled KB2823324, the replacement is now available for MS13-036. What can you do when you need to quickly create several new slides for a PowerPoint presentation and Microsoft Office is installed on your computer at home, not the computer you are using now? Microsoft Office Web Apps to the rescue! Other examples of occasions ideally suited for Microsoft Web Apps include team projects such as managing a Little League team or planning the neighborhood street party that involve multiple people needing the ability to work from the same file. Microsoft Office Web Apps are also a perfect solution for people who seldom need to create a Word, Excel or other Office document. Microsoft Office Web Apps are a simple way to create a Word document, Excel spreadsheet, PowerPoint presentation or OneNote notebook while on the go, save the file to SkyDrive and then email the file with Outlook.com or do additional editing later with Microsoft Office. These simple steps illustrate how easy it is to create Microsoft Office Web Apps. All you need to get started is a free Microsoft Account, an Internet connection and you are ready to go. There are two ways to access Microsoft Office Web Apps. 1. If you are already logged on to Outlook.com, merely click the arrow to the right of then click the SkyDrive icon. After SkyDrive opens, click Create and select the type the type of file you need to create. 2. The second method is to go to Office.com click the "My Office" link and sign on with your Microsoft Account. Scroll past your SkyDrive files and click the appropriate icon located under the Create New heading, depending upon the type of file you need to create. Whether you access Microsoft Office Apps directly from SkyDrive or from the Office.com portal, the rest of the steps are the same. Using Word as an example, a blank document will open with all of the standard formatting tools you are accustomed to finding in the ribbon readily available, including spell check! Split between the two screen captures below is a copy of some of the formatting features available in the Microsoft Word Office App. When you have finished creating your document, merely click the save icon or File > Save. After you have finished creating/editing your document, it is just as easy to share the file with team members, co-workers, family, etc., as appropriate as it was to create the document. 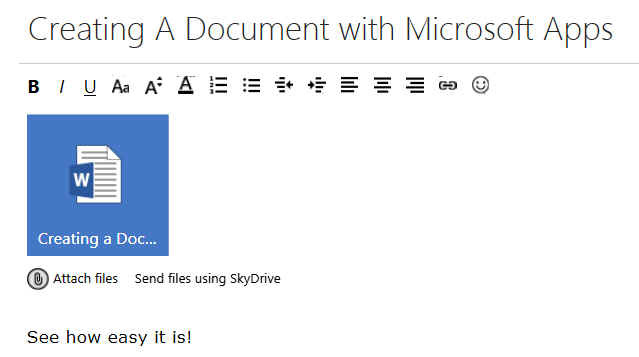 If you are ready to share the document, you can do it right from SkyDrive. Merely click "Share" and you can type in an email address or use one already in your Outlook.com address book. Select whether the recipient(s) need the ability to Edit the document. If it is a business file, check the requirement that recipients need to sign in. 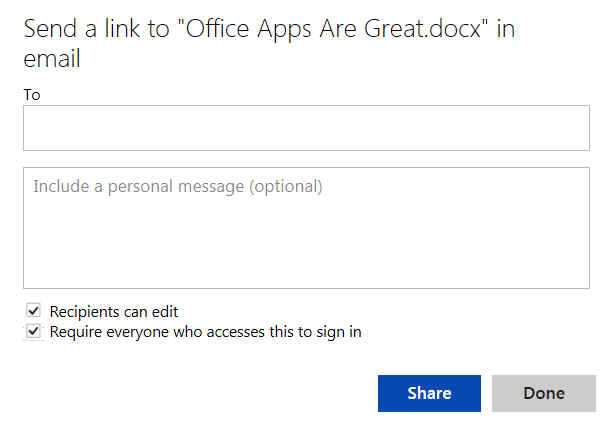 You can also attach the document to an email from Outlook.com. Merely create your email and click the paperclip. 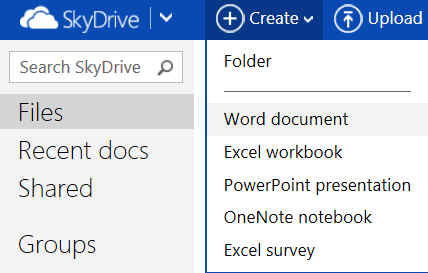 Click your SkyDrive app and select the document. At this point, you can elect to send the file using SkyDrive or attach the file, in which case the recipient can download the document. You can see how easy it is to use Microsoft Web Apps. Give it a try and if you have questions, leave a comment. I'd also love to hear from you if you use Microsoft Office Web Apps for a group or team project. Update 2: Consumer Camp is an excellent resource for, you guessed it, consumers! The purpose of Consumer Camp is to "showcase Microsoft’s consumer-facing technologies, through education and engagement." To learn even more about Microsoft Web Apps, set aside 15 minutes and visit the link below to watch the Office Team's video shared by my friend and fellow Microsoft MVP, Marques Lyons: Getting things done with Office Web Apps. Note: I am a SkyDrive and Outlook.com Insider. If you have a question about this article, please leave a comment and I'll do my best to assist. Learn more about the Outlook.com Insiders program here. Outlook Explodes With Exciting Changes! The recent rumor about the addition of two-step verification being added to the Microsoft Account was true. The announcement about this and other changes to Outlook.com made in The Official Microsoft Blog and the Outlook Blog are both welcome as well as exciting. The most exciting from a security viewpoint is the addition of an optional two-step authentication added to Microsoft Account. By far, this is the most welcome change being made. Among the most popular articles here at Security Garden relate to Hotmail security, particularly the two-year old article relating to a hacked Hotmail account. With two-step verification, often referred to as two-factor authentication, 2FA or TFA, two pieces of information are need to access your Microsoft Account. Both your password plus a code sent to a phone or email address on file as security information are needed. Thus, if your device is lost or stolen or your Microsoft Account password compromised, access to your important information is not possible without that second piece of information. The two-step verification will work on any device where you use your Microsoft account, including Windows 8, any Web browser, as well as Microsoft apps and services on iOS and Android devices. In addition, a Microsoft Authenticator app has been released for Windows Phone. The Microsoft Authenticator app can be found at windowsphone.com/en-us/store/app/authenticator/e7994dbc-2336-4950-91ba-ca22d653759b. Important: It is on your shoulders to keep the security information in your Microsoft Account updated. It is necessary to update your Microsoft Account before you cancel the alternate email address or phone. If you lose access to your secondary security proof, customer support cannot update it for you and it will be necessary to go through a recovery process that enforces a 30-day wait before you are able to regain access to your account. This is done to ensure someone malicious has not used this as a way to take over your account. In addition, if you lose access to your password AND all your security information, you will not be able to regain access to your account. Because the servers are grouped into hundreds of clusters, and only one cluster is upgraded at a time, when the server your account is on has been updated, you will find the option to add two-step verification at https://account.live.com/proofs/Manage. Examples with screen copies are available in Paul Thurrott's article, Enable and Use Two-Step Authentication with Your Microsoft Account. Microsoft added this Two-step Verification: FAQ. Some of the known applications that require a unique app password to sign in include: Xbox 360, Outlook (when using a Microsoft account) and OneNote. How to turn ON/OFF the Microsoft Two-Step Verification? 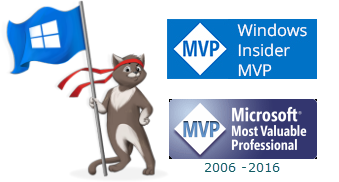 by Microsoft MVP Kunal Chowdhury. A welcome addition with the update to Outlook.com is the ability to sign in with any alias that you have connected to your account. The process of adding and managing aliases has been simplified, including better advice on when it is better suited to add an alias or rename your primary alias. Set up or manage aliases at https://account.live.com/names/Manage. The last bit of news is the addition of 32 new @Outlook email address domains. This will provide the ability to have an @Outlook address unique to your country. Detailed information about this addition is available in the below-referenced articles. The release of WinPatrol 28 includes additions requested by users of WinPatrol. Of particular interest are the WinPatrol Maintenance and Reset Tools, accessible from the "Reset" link on the Plus tab. The tool to solve the issue of more than one Scotty icon in the System Tray is likely to be very popular. My favorite addition is the Plus Info search box added to the Plus tab. There have been occasions when helping others that I would have found this very useful. The addition of Automatic (Delayed Start) for Windows Services will serve to speed start-up time for automatic services that can be delayed during the boot up operation. From the Services tab, sort by Company name. 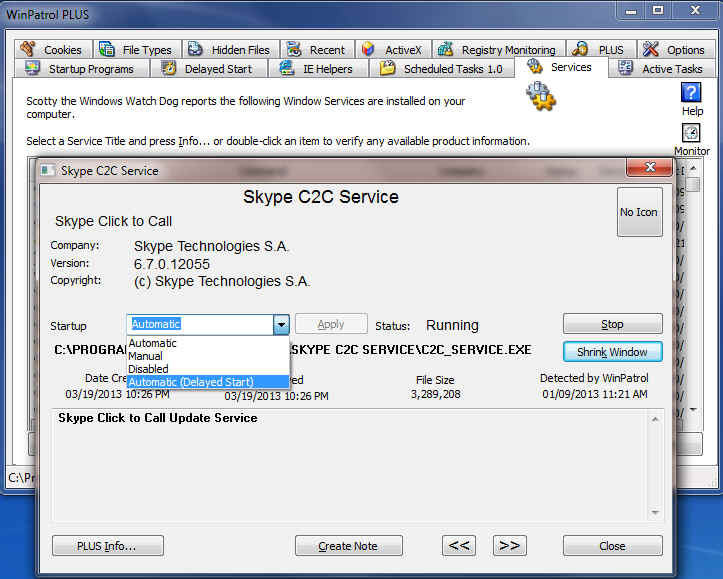 Any Microsoft services that can be delayed, will have the new option available in WinPatrol. Merely click the service to select it and then click Info. Oracle released the schedules critical security updates for its Java SE Runtime Environment software. Application authors and vendors have been encouraged to sign code with a certificate from a trusted Certificate Authority. 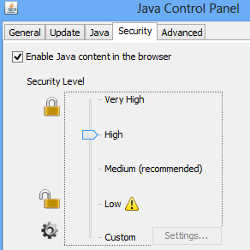 Thus, as part of this update to Java SE 7u21, a change to the Java browser plug-in behavior has been introduced. Java users will be presented with a dialog(s) that will provide additional information regarding the certificate, providing the opportunity to continue or terminate execution. A problem has been reported with security update 2823324 on Windows 7 and Windows Server 2008, part of the update in security bulletin MS13-036. As a result, Microsoft has pulled that update from the download center. Please see KB2839011 Released to Address Security Bulletin Update Issue for additional information. Mozilla sent Firefox Version 20.0.1 to the release channel. The primary reason for the update is to fix the problem many users experienced with the search bar being unusable. If interested, see the complete list of changes (click the "changed" column to sort the date). Adobe Flash Player was updated today. The scheduled release includes new features, security fixes and bug fixes. Adobe has released a security update for Adobe Shockwave Player 12.0.0.112 and earlier versions on the Windows and Macintosh operating systems. The newest version 12.0.2.122 is available here: http://get.adobe.com/shockwave/. As usual, watch for any pre-checked add-ons not needed for the update. Microsoft released nine (9) bulletins. Two bulletins are identified as Critical with seven bulletins rated Important. The critical bulletins address 20 vulnerabilities in Microsoft Windows and Internet Explorer. The bulletins rated Important address issues in Microsoft Windows, Office, Antimalware Software*, and Server Software. *It is important to note that MS13-034 only applies to Windows Defender for Windows 8 and Windows RT. No other security products are affected. The products listed in the table below are major products reaching end of support in the next six months. Of significance is Windows 7 operating systems without Service Pack 1 (SP1) installed. If you have not updated or are not sure if you have SP1 installed, see Windows 7 Service Pack 1 (SP1) Added to Automatic Update which includes instructions on how to check if it has been installed. As a reminder, end of support is just a year away for Windows XP SP3 and Office 2003. Support for Windows XP SP3 and Office 2003 ends on April 8th, 2014. What does it mean when support ends? The most significant change is that the end of support means that there will be no new security updates. There will also not be any non-security hotfixes, free or paid assisted support options, or online technical content updates. The following list represents some of the products reaching end of support in the next 6 months. For a comprehensive list of Microsoft products and their lifecycle policy timelines, please search the Support Lifecycle Product Database. * After April 9, 2013, no Security Updates will be issued for Windows 7 RTM. To remain secure, and continue getting Security Updates, customers are encouraged to upgrade to Windows 7 SP1. On Tuesday, April 9, 2013, Microsoft is planning to release nine (9) bulletins. Two bulletins are identified as Critical with seven bulletins rated Important. The critical bulletins will address vulnerabilities in Microsoft Windows and Internet Explorer. The bulletins rated Important and will address issues in Microsoft Windows, Office, Antimalware Software, and Server Software. I don't recall previously seeing a security bulletin for Antimalware Software. The Advance Notice indicates that the Important update is for Windows Defender for Windows 8 and Windows RT. In the event you missed the announcement, Windows Live Messenger was retired on March 15, 2013. In its various iterations from 1999 to 2013 the Messenger client has had a long life but now is on the way out, replaced by Skype. April 8, 2013, marks the beginning of the upgrade to English-language clients, reportedly ending somewhere around the end of the month with Brazilian Portuguese-language clients, although it may take longer than reported. In addition to this change not affecting China, it is important to understand that it is not the Messenger service that is integrated in Windows Phone and Xbox and used by third-party programs that is ending, rather it is the desktop client. The first step in updating Messenger to Skype is, as expected, downloading the latest version of Skype. As with any software installation, it is important to watch the screens during the installation process rather than blindly clicking through the process. Bing: There may also be an option to make Bing your default search engine. If you do not wish to make Bing your default search engine, uncheck that option. When presented with the screen to sign in with your Microsoft Account, this is the same username and password that you used for Messenger and will include all of your Messenger contacts. To view the series of screens I saved when updating Windows Live Messenger to Skype several months ago, you can see the uploaded collection at Updating from Messenger to Skype. Right-click on the contacts tab. Select "Create new list" and name the list. Right-click your contacts name to add to the newly created list. For users of Skype calling, please remember that Skype is not a replacement for your telephone and cannot be used for emergency calling. The long-awaited Outlook.com calendar refresh has been released and is in the process of being rolled out. Because the servers are grouped into hundreds of clusters, and only one cluster is upgraded at a time, if you do not see the refreshed calendar yet, please be patient it is on the way! then click the Calendar icon to see your calendar. Connecting to your Outlook.com mail or calendar is also easy from your various mobile devices, including Windows Phone, iPhone, iPad, or iPod Touch or Android! Simple instructions are available at Mobile - Microsoft Windows. If, like me, you are still waiting for the Calendar refresh, check out the Outlook Blog, Take control of your schedule with a modern calendar experience for Outlook.com. There are additional topics in the References, particularly for those who are new to Outlook.com. Update: I am now an Outlook.com Insider. If you have a question about this post or Outlook.com, please leave a comment and I'll do my best to assist. Learn more about the Outlook.com Insiders program here. Mozilla sent Firefox Version 20 to the release channel. Included in the update are eleven (11) critical security updates. NEW -- Per-window Private Browsing. Learn more. NEW -- New download experience. Learn more. Additional changes are included in the Release Notes, linked below.